When is the last date to order for Christmas delivery? Please order by Thursday 21st December 2017 1pm for Christmas delivery. The Virtue London office will be closed from 22nd Dec- 2 January. How do I return or exchange a non-faulty item? Please return the item to our head office (G McKenzie, China House, Unit-G-01- 2/A, (Ground Floor) 401 Edgware Road, Cricklewood, London. NW2 6GY) within 30 days of purchase. Include a note to explain what you would like to happen and reasons for the refund or exchange. We cannot exchange or refund non-faulty items that were purchased over 30 days ago- please include a valid receipt. Items must be as new and in original packaging. If you did not purchase your item from our website please return to the store that it was initially bought from. Please note that in accordance with Health and Hygiene laws we cannot return or exchange earrings. Sterling Silver will naturally tarnish over time. When not wearing store your jewellery in a sealed plastic bag to slow down the oxidisation process. Tarnished silver can easily be restored to original condition by polishing the item with a Silver Polishing cloth. 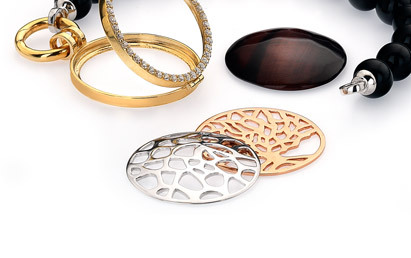 We recommend against silver dips as these can permanently strip layers off the jewellery. If an item is very tarnished use warm water and a soft toothbrush to gently scrub the item then dry thoroughly and finish with a polishing cloth. Gold-plated items need extra care to prevent the plating wearing off prematurely. Never wear the items in water and do not expose to lotions, perfumes or any kind of chemicals. What is Virtue jewellery made out of? We pride ourselves on only ever using Sterling Silver and will never use base metal in any of our products. This Sterling Silver is then either plated with Rhodium, Yellow gold, Rose gold or Ruthenium. All of our materials are genuine- our gemstones are natural and our pearls are freshwater. If you have not received your order within the recommended 5 working days please call us on 0208 343 2828 and we will track your parcel for you. Yes of course- please call us on 0208 343 2828 Monday- Friday between 9am- 5.30pm and one of our team can process your order or help you with any questions you may have. How do I work out my ring size? Why doesn't my natural stone disc look exactly the same as the website picture? The beauty of natural stone is that every single piece is different and unique. All of our stones have been carved from giant, naturally occurring rocks and so the exact pattern of each disc will always vary. I am a retailer- how do I become a stockist of Virtue or White Ice? If you are UK based please call our head office on 0208 343 2828. We also have an Ireland based sales representative and can stock retailers outside of the UK- please email sales@virtuelondon.com for more information or an appointment. Where is Virtue Jewellery produced? All of our Virtue Exquisite range has been exclusively designed and produced in Italy along with our Virtue Keepsake chains which are made to the highest quality. The rest of our jewellery is produced in whichever country specialises in that particular area of jewellery. For example- we sampled natural stones from 5 different countries before deciding that they were most stunning from China. How do I order an engraved disc? Select the size of disc you would like (VKS328 32mm, VKS329 23mm) and complete your order as normal. Please email a clear picture of the image/images that you would like to sales@virtuelondon.com and quote your order number. We strongly recommend also purchasing a pair of glass discs to sit either side of the engraving and protect it whilst in the locket. These are the following codes: VKS375 (32mm) or VKS376 (23mm) and come in pairs. Once we have received your email your disc will be shipped to you within 5 working days. How many discs can I wear in my 23mm or 32mm Virtue Keepsake locket at one time? We have designed a huge variety of discs that are different widths, shapes and textures to offer as much choice as possible. This means that sometimes three discs can fit together and sometimes two. Occasionally a combination of discs will only fit facing one way as the side of the locket showing our logo is slightly thicker than the other side. If you need help with your locket please call our team on 0208 343 2828. Wearing a curved cut-out disc and a curved gemstone disc facing away from each other creates a lovely 3D effect and is our personal favourite. Our flat gemstone and mother of pearl discs (E.g. VKS012) will also fit with all cut-out discs and provide stunning back drops. How many discs can I wear in my 10mm locket at one time? Our mini 10mm lockets can hold two discs at once- each facing away from each other. This means that if your locket flips around whilst you are wearing it there is a pretty disc on either side! How many discs can I wear in my 10mm bracelet or ring at one time? Due to the design our 10mm bracelets and rings can hold one disc which can be swapped for a different disc at any time to change the look of your jewellery. How do I attach a locket onto the beaded necklaces and bracelets? If purchasing any of the beaded necklaces or bracelets (sandstone, agate, pearl and amethyst) you will also need to purchase a jump ring to attach your locket onto the necklace/bracelet. If purchasing a 23mm locket please also buy either VKS389, VKS406 or VKS405 depending on which colour you would like. If purchasing a 32mm locket please also buy VKS390, VKS408 or VKS407. What do I need to purchase if I like the floating charm collection? You will need the usual locket and chain and then a pair of protective glass discs to trap your charms within the locket. These come in pairs so you only need to purchase one. Our silver dividing rings will prevent your charms from sliding down to the bottom of the locket. We offer free UK delivery on all orders over £30. Any order placed before 1pm will be posted on the same day. Orders received after 1pm will be posted on the following day. All orders will be sent using the Royal Mail Signed For service and will require a signature. Delivery will be within 5 working days. If you would like guaranteed Next Day Delivery there will be a charge of £6.95 Monday- Friday. Saturday guaranteed Next Day Delivery will be £10.95. Please select your preference on the checkout page. We are a contemporary jewellery company based in North London. Virtue was initially founded in 2010 with the introduction of the Stacking Ring collection and soon became a well-known name in the jewellery industry. Stacking rings were followed by the Italian Exquisite collection and finally by Virtue Keepsake interchangeable lockets which were launched in 2012.